"Using a combination of treatment methods, including ultraviolet rays and natural wetlands, the plant will produce more than 464 million gallons of recycled water a year — enough to offset the water use of 1,400 single-family homes, the city said." Ellis Creek Wastewater Treatment Plant Trails link with Shollenberger Park's Trails and will together provide approximately 8 miles of walking paths through the wetlands and along ponds. Ellis Creek and Shollenberger Park are linked together ecologically, physically and financially. The 500+ acres of Shollenberger, Alman Marsh and Ellis Creek were acquired and restored with a pooling of resources for protection of this wildlife habitat by the City of Petaluma, The Coastal , Conservancy and the Open Space District. Your tax dollars at work. 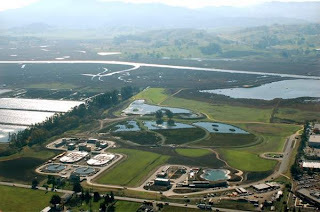 The proposed Dutra asphalt plant on the banks of the Petaluma River, just across from Shollenbreger Park, would degrade and pollute the wetlands, marshes and wildlife sanctuary with toxic by-products of asphalt production and diesel exhaust, excessive noise, toxic storm water runoff, and a disturbing industrial presence. Visitors to this special area could be exposed to significant health risks, and damage to wildlife and habitat could be devastating. Preserve and protect this environment for almost 200 species of birds, 150,000 visitors a year, and defend our tax dollar investment already made to create this international birding destination. Donate today to help fund our fight to defeat the approval of the Dutra Apshalt Plant. Join us at the Completion Ceremony! Shirlee Zane and Valerie Brown were each strong and determined in their voice voting to deny the Dutra asphalt project, however Efren Carrillo switched sides and voted to allow the project to live for another day. Dutra's concessions do nothing to answer the jurisdictional issue of whether County Supervisors have the right to re-zone, to industrial use, the parcels located in a voter mandated scenic view corridor. Only the voters can change this zoning designation. Lowering the production capacity of the plant lessens, but does not eliminate the toxic impacts of this asphalt production facility on a wildlife preserve, 22 schools, hundreds of residences, and 150,000 visitors (and growing) to Shollenberger park per year. Foregoing the recycling part of production still leaves recycled tires (used for rubberized asphalt) in piles on the property. Excessive noise is still created at the barge unloading site and will still require amending the General Plan to allow Dutra to exceed the county noise limits. So what does Dutra gain and why does Supervisor Carrillo want to reconsider his NO straw vote of June 9th? Dutra gains time to wear out the community's opposition. But they underestimate our staying power - For Friends of Shollenberger and all of the other Environmental and Community organizations this isn't about profits, it’s about future generations. With that long view, we will never stop fighting to preserve and protect Shollenberger Park. There is no compromise possible with a company whose environmental record is as worrisome as Dutra's. We hope Supervisor Carrillo will reject the project at the next “Final Vote”, knowing that he went the extra mile for the applicant and its supporters in the construction and aggregate industries, but voting to reflect the wishes of his 5th District. JOIN US TUESDAY 7/21 AT 1PM! This Tuesday, July 21st at 2:00 PM (please arrive at 1pm) the Sonoma County Board of Supervisors will cast their final vote for or against the Dutra Company building an asphalt plant across from Shollenberger Park. At the last meeting three supervisors expressed, in a straw vote, their opposition to the plant while two for it. They could not vote it down at that time because this balance was unexpected and they did not have a resolution of denial prepared, which is apparently needed for a final no vote. On Tuesday they will have two resolutions prepared, one to approve the project, and one to deny it. Despite their most recent straw vote opposing the asphalt plant, we are very concerned that one of the tentative no-voters will change their mind and vote for the project. Therefore, it is very important we see a turn out in huge numbers to ensure that no one on the County board decide to change their vote. Please give us one final push in defeating this project, which is the wrong plant in the wrong place...run by the wrong company. Please join us at the Sonoma County Board of Supervisors chambers at 575 Administration Drive, Room 100A in Santa Rosa this Tuesday and help sway the vote with your presence. Plan to arrive by 1PM so you can secure a spot in the chamber. Interested in carpooling? Meet us at our headquarters at Noon on Tuesday. HQ located at 322 Western Ave., in Petaluma. We are extremely excited to bring you "The Making of the Save Shollenberger Group Photo" starring Scott Hess (and us all!) Thanks Scott!! A very special thanks again to Israel Escudero for putting these documents together! "Dutra Construction, a California-based dredging company, had unlawfully scooped out several football fields' worth of sea grass and several tons of the bay's coral-rock floor below the grass." "Somehow no one noticed that a monstrous gash was illegally being dug into the bottom of Biscayne Bay...This is the largest unauthorized sea-grass-destruction case ever investigated by DERM,” declares Grossenbacher, chief of DERM's coastal resources section." Join us for a Round-Up of Gratitude - 7/16! Join us at Vine and Barrel Wine Shop July 16th, 6pm-8pm for a glass (or 2) of wine, tasty snacks, live music and good company! We are gathering together to celebrate Shollenberger Park, Petaluma's clean air and to thank all of our supporters before the final, final, FINAL vote. Please come down and show your support against the proposed Dutra asphalt plant. WINE + FOOD + LIVE MUSIC = GOOD TIMES! Thanks to the Moms for Clean Air for organizing this event.